I would take the "hand made" description with a large grain of salt. 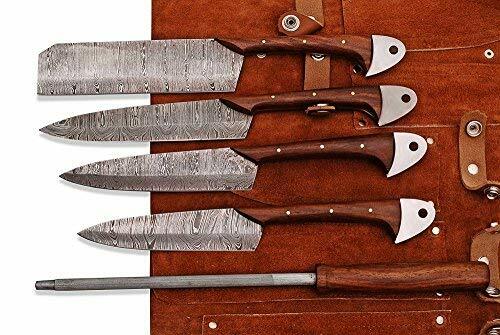 A cursory look through the kitchen knife category shows many of this same set with different handles. While these are high carbon damascus blades, I am pretty sure that the blade profile is cut on a plasma cutter like cookies. From the picture, it looks like they were hollow ground (machine ground) then sharpened. About the only thing that is probably handmade is the putting the different handle scales on and peening the brass pins. Also, the handles on this particular set are very narrow making it difficult to get a good grip. There are other sets with more ergonomic handles for a comparable price. Just my two farthings worth. I'm sure that no matter how they were or were not made, they're expensive.